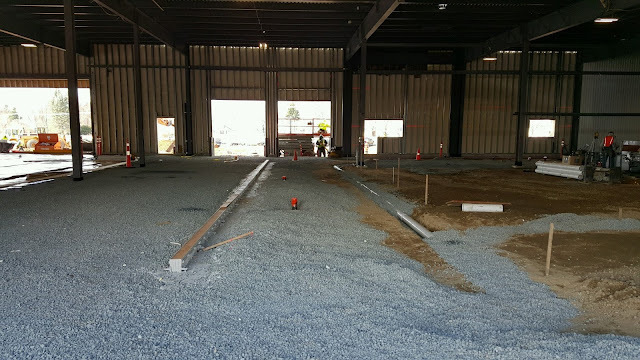 The concrete is prepped and will be ready to pour today! The maturation of the Sonata sedan has been remarkable. Initially a cobbled together four-door using engines from Mitsubishi and pieces from smaller Hyundai cars, the Korean product was an entry-level midsize offering based on price. Today, the newest Sonata is among the five top-selling midsize sedans in America. 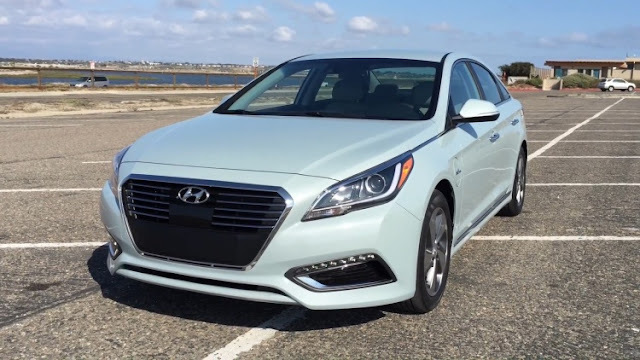 The very popular Hyundai comes in five trim levels, with four different powertrains, including both hybrid and plug-in hybrid models that are honored on Ward’s Ten Best Engines list — the first hybrid-powered vehicles to earn that distinction. In 2011, Hyundai brought a radically redesigned Sonata into production, the second generation of the car to come from the Montgomery, Ala., assembly plant. American buyers gravitated to the new look, an expressive, radical departure from previously staid designs. Unfortunately, buyers back in Korea did not embrace the new look quite as readily and Hyundai elected to tone down front and rear fascias with a mild mid-cycle makeover last year. 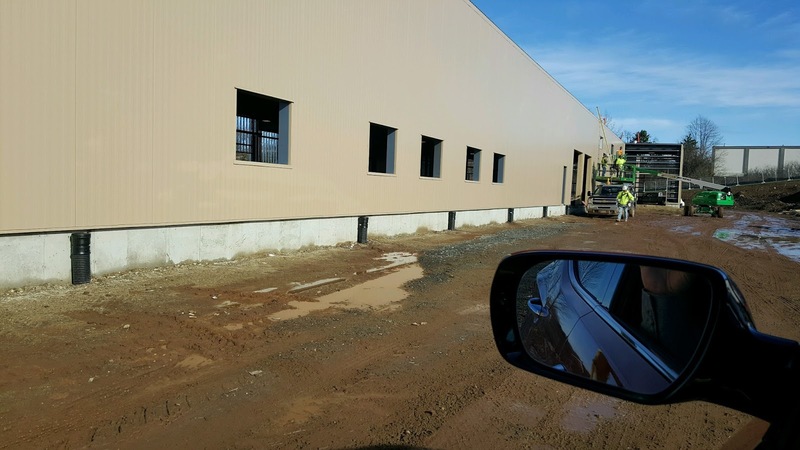 Sales have stabilized — more a factor of the assembly plant’s production limitations than customer desires, as the latest Sonata packs a lot of punch in a well-stocked package. The Sonata Plug-in Hybrid features a 2.0-liter Atkinson-cycle four-cylinder engine married to a 50-kw/67-hp permanent magnet electric motor powered by a lithium-ion battery pack. Running through a conventional six-speed automatic transmission, the Plug-in earns a 99-MPGe electric operation range as well as a 40-mpg combined city/highway mileage rating. Capable of covering up to 27 miles purely on electric-only power, the Sonata Plug-in can also travel up to 600 miles on one charge/tank of fuel — the best in class range. 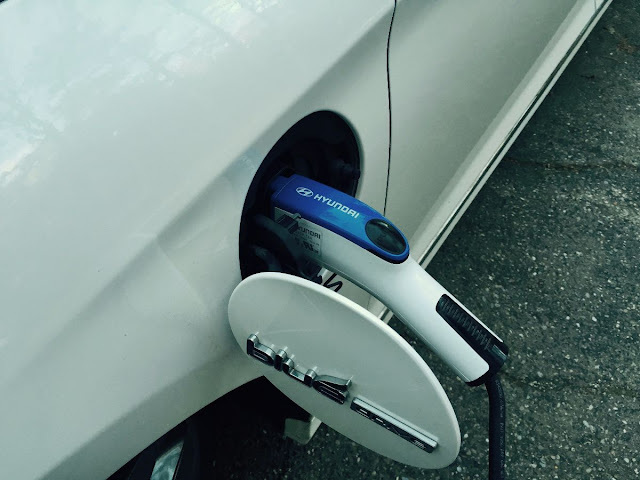 Charging the Sonata is easy, and just as simple as other plug-ins. A heavy-duty cord attaches to a socket in the front fender and a charging station/outlet in your garage, at work, or outside at home. Snow and rain did not deter the charging effort while the Sonata visited, while we also learned that the cord cannot be disconnected if the car is locked. Apparently there are a lot of power cord thefts in more urban areas? Charge time is less than three hours for 240-volt power sources, slightly less than nine hours for regular 110-volt charging, essentially overnight for the regular commuter. During our usage, the Sonata revealed a high of 60-mpg on the extensive info panel before all-electric power was exhausted and the gasoline engine became my primary power source. Even with the initial battery juice consumed, the Sonata Plug-in still functions as a hybrid vehicle, with regenerative braking and battery power held in reserve for passing and peak power requests, so there are still some electric driving assists. Peak efficiency for a 284-mile trip came to 42.4 mpg — combined electric and gas use, (easily beating the EPA estimate) while the Sonata still had more than half a tank of gasoline left. Like Chevy’s Volt, range anxiety is nonexistent in this electric hybrid. Operation is quiet in electric mode, just some whirring of the electric motor. Throttle response is smooth. Low-rolling resistant 17-inch tires did create some worn pavement noise, but otherwise, the Sonata is a solemn road partner. 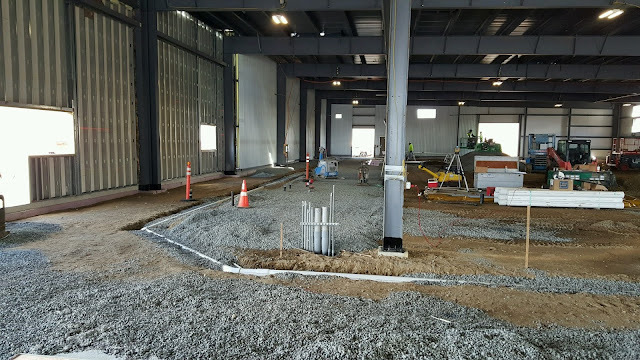 This is where buyers will have to weigh the pros and cons to spending the extra money for the Sonata’s Plug-in model. The Plug-in asks little in the realm of compromises; the Sonata’s limousine-like rear seat proportions remain, the trunk still has ample room for cargo and the car’s front drive chassis delivers ride and compliance composure that match the rest of the midsize sedan segment. Stocked with the usual plethora of Hyundai features, creating lofty price/value quotients, the Sonata Plug-in’s sticker price may give pause despite a hefty $4,919 potential tax rebate. Base Sonata SE sedans start at $21,750 with a 2.4-liter four and EPA ratings of 25/38 mpg. Sonata Eco models earn EPA ratings of 28/38 mpg ($23,725) while regular Sonata Hybrids, $26,000, have an EPA fuel efficiency number of 40/44 mpg. The Sonata Plug-in starts at $34,600 ($39,610 as shown here in top Limited trim). That is a big retail leap for a modest gain in overall efficiency, even if you qualify for the tax rebate. Given the state of today’s fuel prices, it is reasonable to understand that hybrid and plug-in hybrid vehicles are facing considerable market resistance. But we know the current conditions won’t last — everything oil-related runs in cycles, some better than others. 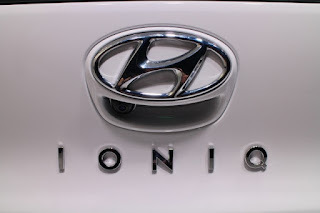 Hyundai is banking on that reality, as well as ever-increasing fuel economy standards, and has also created the Ioniq, a compact hybrid car meant to challenge Toyota’s Prius. The Ioniq looks more like a conventional car, apparently gets about the same fuel economy as the Prius while delivering more power, and we know that it will be priced less than the Prius — that is just how Hyundai rolls. Look for the Ioniq at Hyundai dealers this fall. Hyundai also builds the Tucson Fuel Cell Crossover, but that little trucklet is only available, currently, in very limited markets — like California — as there are very few re-fueling sites, a condition that doesn’t look like it will change in the short term. Two other pieces of Hyundai news are worth noting here as the whole brand reflects the maturity evident in this Sonata. 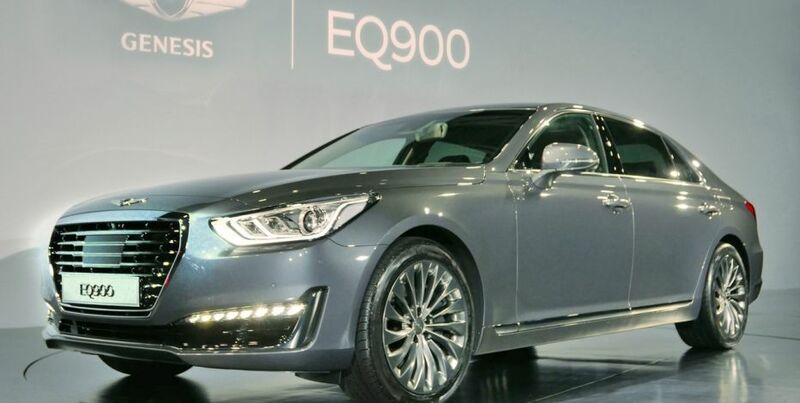 Going forward, all of Hyundai’s luxury models — Genesis and Equus — will be sold under the single Genesis label and only at conventional Hyundai stores as the automaker eschews the expense of creating a stand-alone luxury retailer. Makes perfect sense as both Acura and Infiniti are having difficulty separating consumer recognition as well as the products they sell from the cars and crossover upon which they are based (from Honda and Nissan respectively). Hyundai will also jump into the revived midsize pickup class with a Honda Ridgeline-like Santa Cruz vehicle late this year. 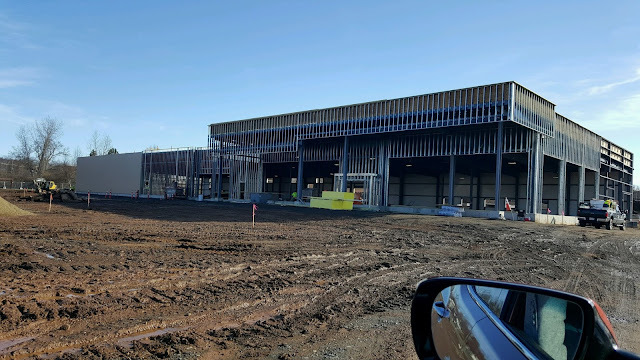 Details are few now, yet preliminary photos show great promise. A great interior on the Sonata, complemented by extended driving range and urban electric commuting, give the Hyundai sedan an edge over some rivals. Low gasoline pricing may make market success a longer-term proposition however. Sonata measures 191 inches long, 73 inches wide, 58 inches tall on a 110-inch wheelbase. Base weight is 3,315 pounds. Other powertrains: a 2.0-liter, 245-hp turbo-four is available on Sport and Limited trim models while the 1.6-liter 178-hp turbo-four used in the new Tucson is also available. Limited trim on our Plug-in Hybrid tester included the usual 10-year/100,000-mile warranty, plus; lifetime battery warranty, five-year roadside assistance, forward collision warning, lane departure warning, blind-spot detection with rear cross-traffic alerts, rearview camera and rear parking sensors, HID and LED lighting, push-button start with proximity key access, heated leather seating with memory, cooled front seats, smart-cruise, navigation, heated steering wheel, Infinity Audio with XM, plus Hyundai’s Blue-Link telematics assist. The Sonata Plug-in hybrid is assembled in Korea. 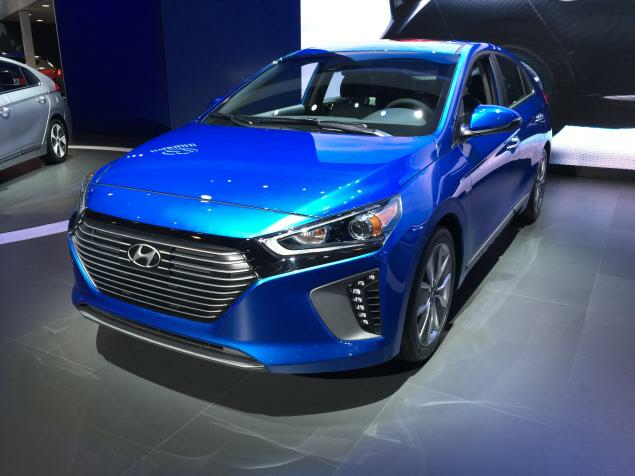 This week in New York Hyundai’s Ioniq was introduced to the U.S. market. The car with choice of electrified powertrain will begin sales with the 2017 hybrid and battery electric versions in the fourth quarter of this year, and a 2018 plug-in hybrid version will follow a few months into next year. Having been revealed on the world stage early this month in Geneva, Hyundai says the trio of green cars is a significant “milestone” in its play to take on Toyota, anyone else, and the growing green car market. The Ioniq is also the world’s first dedicated electrified platform for which Hyundai can receive credit while also having saved billions in development costs that would have been incurred if it had separately developed three new cars. Shared by all three variants therefore are core specifications including significant use of aluminum and high strength steel to cut curb weight, seen as mission critical for maximum mpg. These inaugural cars representing a new model line for Hyundai are intended to stay relevant through the next decade and are designed with expected creature comforts. Included are details like Apple CarPlay and Android Auto, wireless smartphone charging, 7-inch TFT display and advanced safety features. Tech in the safety department includes Automatic Emergency Braking with Pedestrian Detection, Lane Departure Warning, Blind Spot Detection, Rear Cross-Traffic Alert and Smart Cruise Control. The Ioniq Hybrid was benchmarked against the Toyota Prius and is projected by Hyundai to be certified by the U.S. EPA at 57 or 58 mpg. This is not official, but assuming it becomes so, it will surpass the most-efficient 56 mpg Eco version of the 2016 rival from Japan, and take the top mpg spot among non-plug-in U.S. market cars. 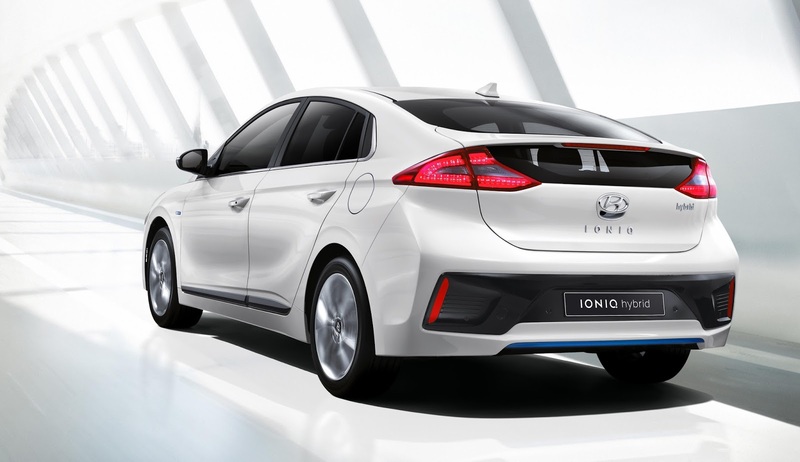 The plug-in Ioniq builds on the Hybrid’s powertrain but adds an 8.9-kilowatt-hour lithium-ion polymer battery for emission-free driving. Manager of Product Planning, John Shon says it will offer more than 25 miles EV range, but less than 30. In Europe it’s rated 32 miles (50 km). The new Prius Prime plug-in hybrid also launched yesterday has an 8.8-kwh battery and is estimated for 22 miles. Toyota has said its new Prius line is more sporty than the previous model, touts an independent rear suspension, and wouldn’t you know, the Korean upstart also speaks of sportiness with independent rear suspension. Do you think Toyota knew who was going to come knocking on its back door when it redesigned the fourth-generation Prius for this year? Other Hyundai specs mirroring Toyota’s best-selling hybrid is an engine with “unsurpassed thermal efficiency” of 40 percent – unsurpassed that is, except it equals the 40 percent Toyota also claims. This engine built for hybrid applications is a direct-injected 1.6-liter Atkinson cycle serving up 104 horsepower, 109 pounds-feet of torque. The electric motor in the hybrid versions provides an estimated 43 horsepower (32 kilowatts) with maximum torque of 125 pounds-feet. In the regular Hybrid is a lithium-ion polymer battery with 1.56 kwh capacity. Combined system power is estimated at 139 horsepower. 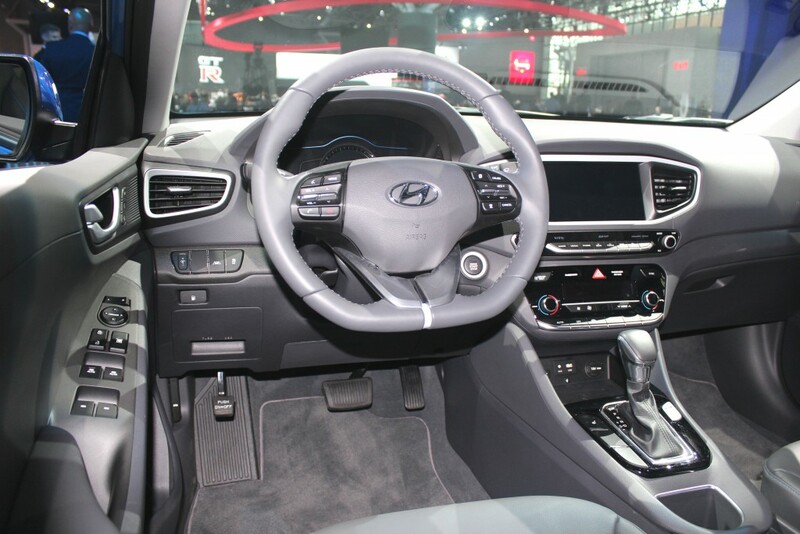 Where Hyundai deviates from Toyota’s Prius and other hybrids which use a continuously variable transmission (CVT) however, is with a six-speed automatic manual, also known as a dual clutch transmission (DCT). This unit promises superior highway mpg, while giving up some efficiency in city compared to the Toyota’s CVT, said Mike O’Brien, vice president of Corporate and Product Planning. The Ioniq’s actual highway/city/combined numbers will be competitive with the Prius, but Hyundai’s choice of DCT follows its existing hybrids’ avoidance of CVTs – a move favored by traditionalists who like the sound, feel, and potential control of stepped gearing. Hyundai’s Ioniq further mirrors Toyota however with its coefficient of drag – a “class leading” 0.24 helps the Ioniq slip through the wind and save fuel. Here too, it is class leading, but also happens to equal the Prius’ 0.24 cd, which itself matches that of the Tesla Model S.
Dimensionally the Korean and Japanese hybrid (see Prius hybrid spec sheet in gallery) are within inches or a fraction of an inch and ride on the same 106.3-inch wheelbase. Hyundai figures maybe between October and November, or maybe by December the Hybrid will go on sale. It will be marketed and stocked in all 50 states. The plug-in hybrid will follow and will be marketed just in the 11 and counting ZEV states following California rules, but Hyundai dealers in all states may choose if they wish to stock and/or special order the PHEV for buyers who want it. 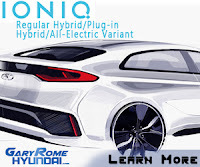 Nearly everything structural and design-wise about the Ioniq Hybrid and Plug-in Hybrids is true also of the battery electric Ioniq except, of course, it burns no gas. As intended from its inception, it is a case of delete engine; insert all-electric powertrain. Centered around a 28-kilowatt-hour lithium-ion polymer battery mostly under the rear seats, the EV pending EPA certification is expected to deliver 110 miles range. Its electric motor is estimated at 120 horsepower (88 kw) and 215 pounds-feet of torque. As is customary, a single-speed reduction gear transmission is employed. Hyundai is also touting a very high 125 MPGe estimated rating. If this is so, it will edge out the 124 MPGe BMW i3. The Ioniq trio appears to be the closest rendition yet to a jack-of-all (electrified) trades, and master of some – not “none” – as it does promise efficiency and performance in all three versions that could lead to a respectable value proposition. As noted above, the Ioniq Hybrid is predicted to beat the 2016 Prius in mpg, if only by a little bit, and with variances between city efficiency and highway. The Plug-In Hybrid likewise beats the 2017 Prius Prime with more than 25-plus miles range versus 22 estimated – but again, neither Toyota nor Hyundai have announced EPA-certified numbers yet. In hybrid mode, the Hyundai also stands to edge out the Prius Prime, though this is to be determined, as the Ioniq Plug-in Hybrid’s MPG is expected to be slightly lower than the Ioniq Hybrid due additional curb weight. Otherwise, its e-range will beat the 19-mile Ford C-Max and Fusion Energis, should fare well against the 27-mile Hyundai Sonata and Kia Optima PHEVs, but other plug-in hybrids may eventually surpass its e-range, and the 53-mile 2016/2017 Chevy Volt already does. As for the Ioniq Electric, some EV fans – already jaded by future products like the 2017 Chevy Bolt, Tesla Model 3, and next-generation Nissan Leaf – have been less than kind in assessing Hyundai’s EV with just three miles more range than the new/old 2016 Leaf. Hyundai was not caught sleeping at the wheel, however, and offered some views on how it sees things working out. 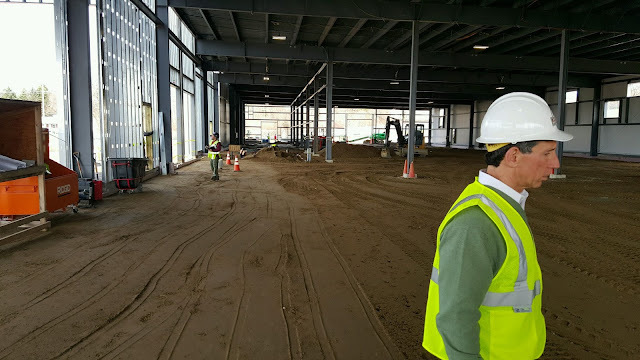 “The main thing that we saw for electric vehicles is, you know, 200 miles range like the Chevrolet Bolt is planning,” began Shon when asked about the Bolt. “What are the real advantages to that other than the fact that you’ll go 2-3 days without charging?” he posed rhetorically. This is not to say Hyundai declares 200 miles irrelevant or superfluous, but speaks mainly to certain buyers who are fine with low-100s while saving on weight, potential battery cost, and potential packaging complexity, as the case may be. At the end of the day, Hyundai is fully aware the new benchmark is about to leave 110 mile EVs and O’Brien said what EV fans have suggested – it may price the car to make it still worthwhile. 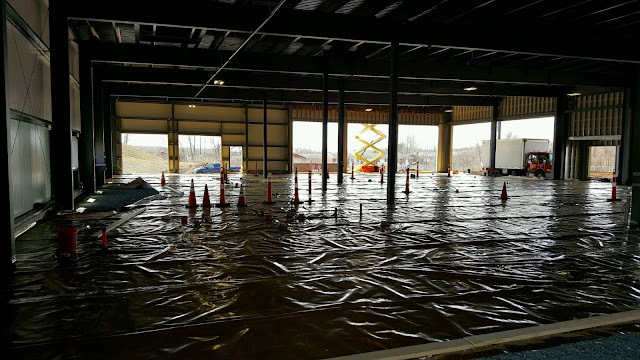 “Remember one key point is manufacturers don’t set the price, the market does. If you look at a Fiat 500 Electric – now below $100 month payment – it wasn’t Chrysler’s wish to price it below $100 a month. Right? 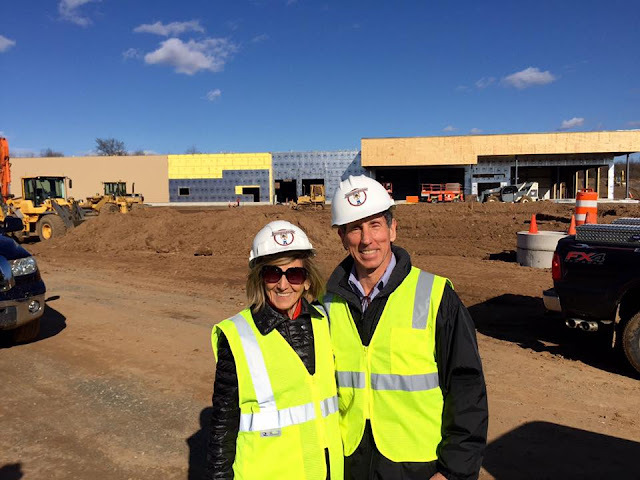 It was the market,” said O’Brien of a lease payment for that limited-market car. “So they had to adjust. So all manufacturers end up – in the final analysis they’re going to price to what the market will absorb. Major manufacturer EVs have only been on the market since the 2011 model year, and how this will all shake out remains to be seen, but O’Brien suggested varying performers will settle similar to how conventional vehicles have. Today there are internal combustion vehicles ranging from economical four cylinders, he said, to V8s and buyers have to choose how much engine they want. A similar corollary might be seen with EV range and inexpensive but effective 110 mile or so EVs may work for some while others will want 200, 225, 300 and whatever else may come along. O’Brien said Hyundai’s all-of-the-above approach to alternative fuels – which includes hydrogen – means it’s hedging its bets on how future regulations and customer preferences may shift the market. The Ioniq line itself was intended to try to be closer to a normal alternative that happened to be green. The drive experience will not be weird, but rather O’Brien said the car is not much different than a sharply tuned Elantra. For all the talk of “sportiness” between Toyota and Hyundai, the qualifier is they are speaking of hybrids not normally associated with that trait at all. Hyundai unveiled a gorgeous new concept car at the New York International Auto Show this week, the Genesis “New York" Concept. It not only hints at future design direction; it will also result in a real car within the next 18 months, according to Hyundai insiders. Sized in between typical D-segment and E-segment cars (3-series and 5-series BMW sedans, for example), the New York is decidedly not a moonshot that dares to redefine design. Rather, its proportions and form factor follow the well-understood "three-box" convention (a hood, a cabin, and a trunk). But, as with anything worthwhile, the devil’s in the details and we think Hyundai’s beaten the devil. Hyundai is spinning off its Genesis cars into a new brand—think Nissan/Infiniti, Honda/Acura, or Toyota/Lexus. The Genesis brand currently has but one car production car, the G90, and is aiming for BMW’s M division with its own N division. Judging by the New York Concept, the competition should be on alert. "This car is not really a show car," Hyundai and Kia chief designer Peter Schreyer told us. "It's much more a glimpse into the future of Genesis. For us, starting from scratch as we did with the New York is a designer’s dream. We can build from a clean sheet; we don’t have to adapt to a prior work." While the New York is aggressive, it is simultaneously slim, a difficult achievement. With a very low roof, the DLO (day light opening or side window space) at the sides appear shallow. Painted dove grey with a hint of blue, the New York’s color reminds us of classic 1950s German hues. The tapered derriere is even more elegant than the front, using very slim and jewel-like taillamps and four exhaust pipes visually offset by copper trim, itself a corporate color of the company’s. Hyundai and sister company Kia have been home to one of the auto industry’s finest designers, Peter Schreyer, for many years and recently picked up Luc Donckerwolke from Bentley to succeed Schreyer as head of design for the corporation. And at Hyundai Design North America, Chris Chapman is Hyundai’s chief designer, the man chiefly responsible for pushing the concept and eventual production BMW X3, X5 and Z4 models while a key player at BMW Group’s DesignworksUSA in California before heading up new vehicle and concept design at Hyundai N.A. in 2012. I asked Chapman about the New York’s guiding principle. "What you see must feel natural, pure and at ease in it’s own skin," Chapman says. "Everything must instinctually be in the right place, and that begins with proportions. Highly complex or intellectual design doesn’t normally work to most eyes. If it looks and feels natural, you know the design team has taken the time to cook it properly." In this regard, the New York is not complicated. It uses simple surfaces. The proportion, its volume, and the car’s stance are all well-understood and conventional. At the very front, the New York is bracketed by dimples that look to be inspired by F1-inspired barge boards or a race car’s front wing end plates. This may seem far-fetched and fussy, but it works brilliantly to make the front seem even wider and offer a kind of architecture. Simultaneously, the rear echoes this design with smaller dimples than the front, which still accentuate the width of the fenders at the rear. We asked Chapman what primary or single theme he’s most proud of on the New York Concept. "A car’s C pillar is the prime real estate for design," he says. 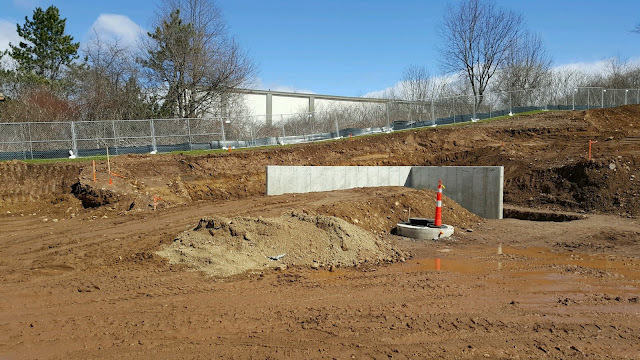 "That’s the place where the car lives or dies design-wise. The beauty of a good C pillar makes or breaks the car. If it’s too thick or thin, if it leans too much or too little; those are the critical questions. On the New York, it’s just right. When the C pillar works you don’t have other battles to fight." Chapman also cites the classic BMW Hoffmeister kink and the Lamborghini Miura (technically, a B Pillar) as paragons of C pillar achievement. Interestingly, the little wind splits at the B pillars also give the DLO a new kind of detail. Unquestionably, design is the first and strongest stake in the ground for any automotive brand. In that regard, Hyundai’s Genesis just served a well-done one that’s also rare. You immediately know which Ioniq is fully electric because the front end sports a panel that looks like an electric stove top with no burners—electric cars don’t need vents to cool the powertrain. Luckily we’ve largely moved away from bizarre exterior design heralding alternative powertrains as a political statement and embraced good design. The Ioniq uses fluid lines and natural airflow channels that result in a sporty hatchback profile. The hybrid sports Bi-Xenon HID headlights surrounded by C-shaped LED daytime running lights. The Plug-in features low-beam LED daytime running lights. The goal—especially with alternative powertrains—is aerodynamic efficiency and Hyundai has placed itself in Mercedes B-class territory with a coefficient of drag (Cd) of 0.24 with the Ioniq line. 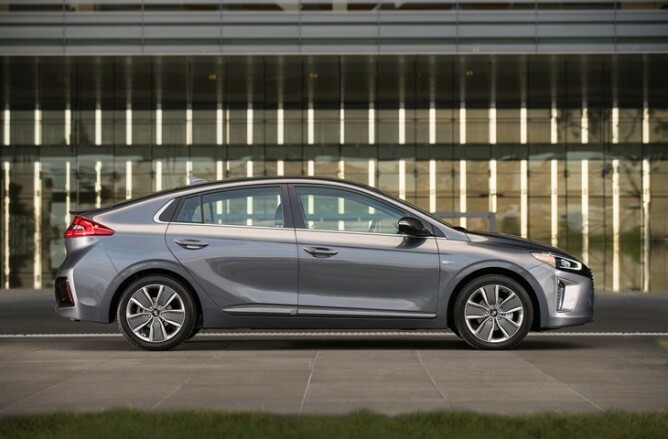 The Ioniq Hybrid and Ioniq Plug-in Hybrid both feature a new 1.6-liter, direct injected four-cylinder engine that delivers an estimated 104-horsepower and 109 lb.-ft. of torque. The hybrid’s accompanying electric motor, powered by a lithium ion polymer battery, delivers about 43-horsepower with an estimated 125 lb.-ft maximum torque. The motor powers the car at low speeds and assists at higher vehicle speeds. The plug-in provides an estimated all-electric range of about 25 miles and is powered by a 8.9 kWh lithium-ion polymer battery. The plug-in’s estimated 45 kW (60 horsepower) electric motor is combined with the 1.6-liter four-cylinder engine. These polymer lithium-ion batteries are lighter and take up less space than cell type batteries. Hyundai has managed to tuck them under the rear seats, allowing for more cabin space. Charging up to 80-percent takes about 20 minutes using a fast charger system. Hyundai spurned the traditional CTV transmission, opting instead for a six-speed dual-clutch transmission that uses low friction bearings and low-viscosity transmission oil to extract performance and efficiency. The Ioniq Electric has a range of 110 miles and is powered by a 28 kWh lithium-ion polymer batter. The electric motor has a estimated maximum output of 120-horsepower and 215-lb.-ft. of torque. The interior has been laid out to achieve a clean look that is logical and clutter-free. Careful attention has also been paid to safety. Use of high strength steel, active safety features like blind spot detection, lane change assist, rear cross traffic alert, automatic braking, pedestrian detection and tire pressure monitoring are available or standard. While it has arrived late to the alternative fuel party, Hyundai has been on a roll with new and improved vehicles like Sonata, Santa Fe, Elantra and Azera. They’ve even spun the Genesis nameplate into a separate luxury division. Will the Ioniq now take the fight to green machines like the Chevrolet Volt, Nissan Leaf and Toyota Prius? 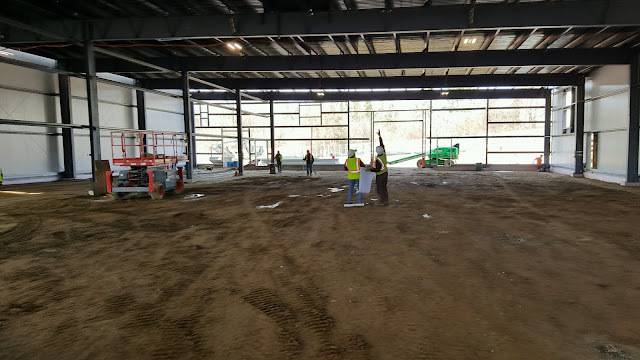 Time will tell, but you can get your first glimpse of what's to come here in New York. As electric-car range moves above the 100-mile mark in EPA ratings, one of the more interesting models to watch will be the 2017 Hyundai Ioniq Electric. 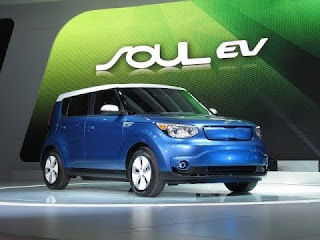 That car uses essentially the same 28-kilowatt-hour battery pack as the low-volume Kia Soul EV, a blocky tall wagon that's rated at 93 miles. Can the slimmer, sleeker Ioniq Electric match or beat the latest 2016 Nissan Leaf, rated at 107 miles? According to Hyundai engineer Kim Choong, the answer is yes: the Ioniq electric car is expected to achieve a U.S. range rating of 110 miles. 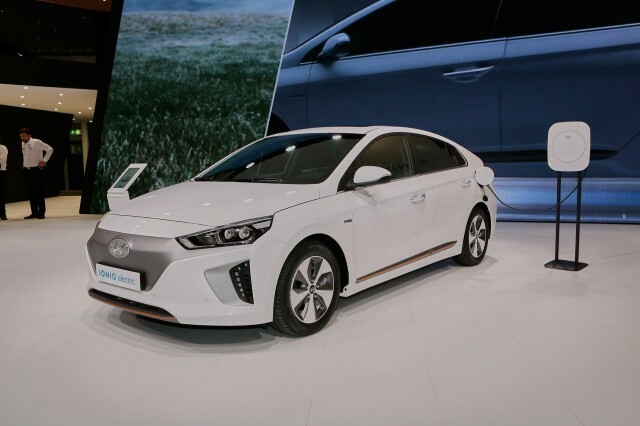 That affirmation comes from Automotive News reporter Hans Greimel, who attended the South Korean debut of the 2017 Ioniq range at Hyundai's technology center in Seogwipo. A year or so from now, the Ioniq Electric will join the latest Leaf and also an updated 2017 BMW i3 with ranges over 100 miles. Of course, the 2017 Chevrolet Bolt EV has been promised to deliver a 200-mile rating, which will reset the bar—as will the Tesla Model 3, also with a 200-mile promise, that is to be unveiled on March 31. Other details about the Ioniq Electric that emerged from the debut include paddle shifters that let drivers choose from one of four levels of regenerative braking. That feature pioneered on the low-volume Cadillac ELR, and was extended to the 2016 Chevy Volt; it will also be used on the Bolt EV. The same effect can be achieved in the Nissan Leaf by shifting into the "B" or low range, which increases regeneration. The BMW i3, on the other hand, comes standard with regenerative braking that's strong enough to bring the car to a complete stop when the driver lifts off the accelerator. Hyundai and its sister company Kia together have aggressive plans to become the world's second highest-volume maker of green cars by 2020, after Toyota. Each company now offers hybrid and plug-in hybrid versions of their high-volume mid-size sedans, the Sonata and Optima respectively. Kia has the Soul EV, and Hyundai has the low-volume Tucson Fuel Cell and the upcoming Ioniq range, which will include Hybrid, Plug-In (hybrid), and Electric versions. Hyundai's top-selling car in the United States, the Elantra, has been nicely restyled and upgraded to the point that its 2017 model could pass for a higher-priced luxury car. The new Elantra, which is already at dealerships, has a surprisingly refined ride and can be stocked with features like heated rear seats, driver-seat memory settings, automatic emergency braking with pedestrian detection and headlights that swivel to the side to illuminate roads during turns. The 2017 Elantra even has a hands-free trunk that opens on its own when a driver, perhaps laden with grocery bags, has the car's proximity key fob in his or her pocket or purse and stands within 3 feet of the back of the vehicle for at least 3 seconds. It also comes with something that no luxury car has: Hyundai's 10 years/100,000-mile warranty of coverage on the car's powertrain and five years/unlimited miles of free roadside assistance. Starting manufacturer's suggested retail price, including destination charge, is $17,985 for the base 2017 Elantra SE with six-speed manual and $18,985 with six-speed automatic — some $100 less than the starting retail prices for the base 2016 Elantras. The top 2017 Elantra — the Limited— has a starting retail price of $23,185, and prices can approach $28,000 when all luxury features are added. 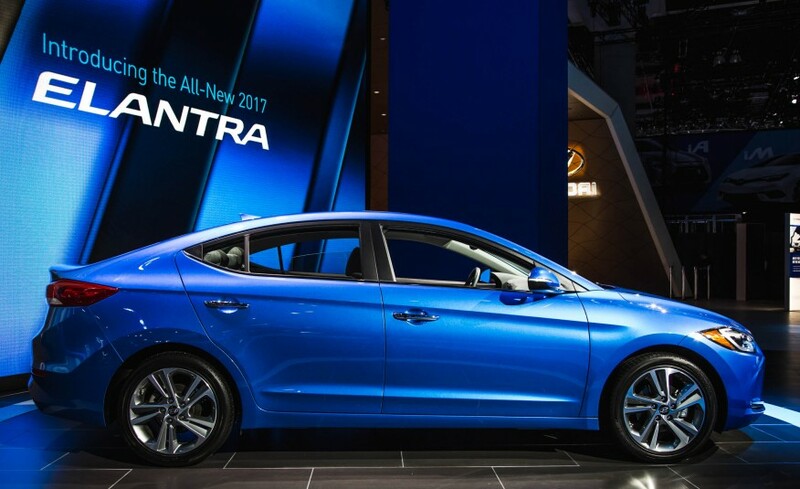 The Elantras have a new 147-horsepower, four-cylinder engine that generates 132 foot-pounds of torque at 4,500 rpm. It's also lighter than its predecssors, even a loaded Elantra Limited weighs less than 3,000 pounds, according to Hyundai. As a result, the Elantra Limited test vehicle performed capably. The test vehicle impressed with its virtually vibration-free ride. The driver didn't detect powertrain vibrations or any roughness, even when resting a hand on the Elantra's gearshift lever when the car was idling. When the Elantra accelerated, some engine noise could be heard, but it was strong, not a buzzing sound. 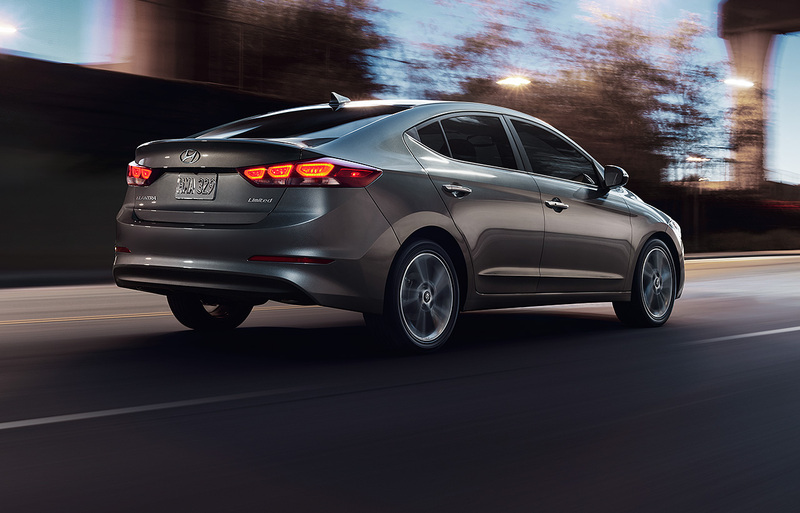 The restyled Elantra maximizes aerodynamics, which eliminate drag and help fuel economy. The test vehicle averaged nearly 29 miles per gallon in mostly city driving that was done primarily in Normal, not Eco, mode; with 14-gallon fuel tank, it could travel a noteworthy 400 miles in mostly city driving. The U.S. government rates the 2017 Elantra Limited at 28 mpg in the city and 37 mpg on highways for a combined 32-mpg average that makes the Elantra second best among gasoline-powered, non-hybrid sedans of its size. Inside, the Elantra is comfortable, particularly for front-seat passengers, who have up to 42.2 inches of legroom and nearly 39 inches of headroom. Back-seat passengers have 35.7 inches of legroom and 37.3 inches of headroom, which allows two adults to travel well. A nice touch is the pull-down rear-seat armrest with cupholders, which doesn't flop loosely or rest at a downward angle. Rear seatbacks split 60/40 and fold down so that the Elantra's 14.4-cubic-foot trunk can accommodate long items. Fit and finish of the Alabama-built Hyundai Elantra tester was excellent, and the tactile feel of the car's buttons and knobs was akin to a luxury car's. However, the base Elantra SE doesn't include a standard rearview camera nor does it have the hood-insulator material that comes on the Limited, meaning its interior isn't as quiet as the Limited. A second Elantra engine — a turbo with 158 foot-pounds of torque — is due this spring, when the 2017 Elantra Eco debuts. Hyundai is looking at shaking up the compact-car market with the introduction of the redesigned 2017 Elantra sedan. When it entered the market with the Pony in 1984, the Korean manufacturer found success providing a less-expensive alternative to the Japanese vehicles dominating the low end of the market. In the last three decades, it has come a long way, with improvements in fuel economy, reliability and, in recent years, style. With the 2017, the sixth generation of the Elantra, Hyundai has given its best-selling compact car (slotted between the Accent and the Sonata) a little shove over the top, with features previously only found in near-luxury vehicles. You can still buy a plain-Jane Elantra L Manual for $15,999, but for the first time, you can also opt for a fully loaded Ultimate model for $28,799, which is what I tested. In Canada, the Elantra sedan is available in seven trim models. 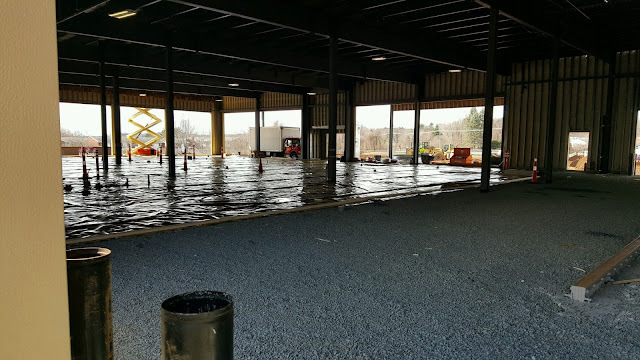 Unlike with some other manufacturers, there are no option packages or even individual options. The only choice is in colour, three with the base car and up to seven at the top end. I mention the trim options because the model line south of the border is completely different, so if you are reading an American review, it can get confusing. One of the big differences between the two countries is what is available under the hood. In Canada, there is only one engine choice, a 2.0-litre four-cylinder producing 147 horsepower. If you want a six-speed manual transmission, the only model offering that is the base L; every other model is equipped with a six-speed automatic with manual mode. 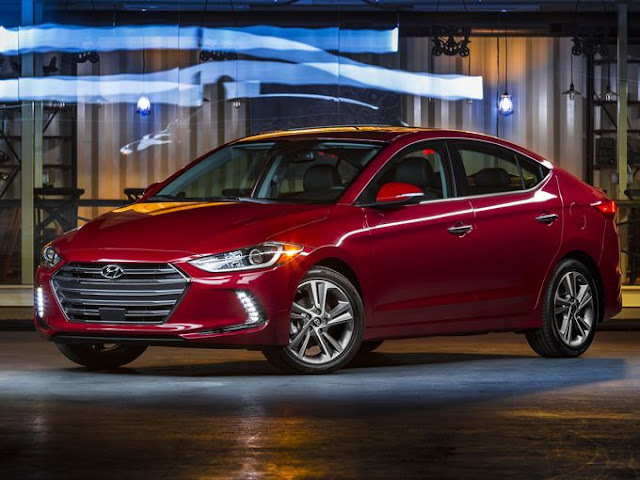 The Elantra’s 147 hp is smack in the middle of its segment, with the Toyota Corolla at the bottom and the Mazda3 at the top, boasting 37 more horses and better than 50 more pound feet of torque from a larger 2.5-litre engine. The Elantra’s fuel economy is mid-pack as well, with the new Honda Civic sipping less fuel than the rest. The compact car wears a new set of clothes, with a design that makes it a slimmed-down version of the Sonata. My tester came with LED daytime running lights and High Intensity Discharge headlights that turn in sync with the steering wheel, better illuminating a corner. Hyundai added the new Ultimate package to the top end of the line this year. The Limited, last year’s top trim, already includes nice-to-have features such as leather seats, eight-way power driver’s seat, navigation, eight-inch touch screen and rear parking sensors. To that list, the Ultimate adds the most sophisticated driver aids available — autonomous full emergency braking at speeds under 80 km/h when sensing vehicles and under 64 km/h when sensing pedestrians. It has adaptive cruise control, which will maintain a certain distance from a vehicle ahead, regardless of speed. It will also work in stop-and-go traffic, which I believe is a first for this segment and even rare among cars costing tens of thousands more. The Ultimate also has lane-departure warning and lane-keeping, where it will engage and provide corrective input (in other words, steer your car) when it senses the vehicle drifting out of its lane. The self-driving car may be a few years away, but the driver aids in this Hyundai shows the road the industry is heading down. The impressive fact is that such aids are standard in a sub-$30,000 vehicle. While the overall car is more refined, the interior still has some hard plastic surfaces, despite its up-market aspirations. To its credit, it does come with features not commonly found in similarly priced Japanese or North American competitors, such as a heated steering wheel, heated rear seats, a hands-free trunk and front-door-handle approach lights. Couples who share a vehicle will also appreciate the dual memory settings. Hyundai also pairs rear parking sensors with the rear camera, giving drivers both an audible and visual aid. The rear seatbacks fold 60/40 to access the 407-litre (14 cubic-foot) trunk. The back-seat passengers get a few more millimetres of legroom, giving them as much room as in a mid-sized sedan a generation or so ago. The Elantra even sounds better, thanks to thicker glass and the fact that every gap between the engine and passenger cabin is plugged with extra foam. Equipping the car with an eight-speaker audio system (with a subwoofer in the trunk) doesn’t hurt, either. For those who have audio libraries on their phones, the Elantra is compatible with both Apple CarPlay and Android Auto. That means the audio system responds to a whole range of voice commands for hands-free driving. The driving public has obviously taken note of the new Hyundai Elantra. Last month, it easily outsold its nearest competitors, the Honda Civic, Toyota Corolla and Chevrolet Cruze. It’s too early to say if it can keep up the momentum for the rest of the year, but don’t be surprised if it does. After all, Hyundai did shake up the market more than 30 years ago. With this new and improved car, it has a chance to do it again. One claim made by Hyundai that turned many heads is that the Ioniq has the ability to beat the Toyota Prius in regard to highway mileage. Though there are still not official EPA numbers on that, it seems that other numbers posted by the hybrid Ioniq is worth a look. It seems that the Ioniq has better performance specs than the Prius, and that is noteworthy considering how much Toyota has emphasized its hybrid’s performance aspects. Using an enhanced hybrid powertrain from the one that runs that Sonata Hybrid and supposedly superior lithium polymer batteries from LG Chem, the Ioniq has a hybrid output of 139hp and 109lb-ft torque in comparison to 121hp and 105lb-ft in the Prius. It does so with a 1.6L four-cylinder and a 32kW battery, whereas the Prius combines a 1.8L four-pot with a 53kW battery unit. On paper the Ioniq can sprint to 60mph from a standstill in 10.3 seconds, 0.2 seconds quicker than the Prius despite weighing 32lbs more and having bigger dimensions. They may have the same wheelbase length but in terms of width, the Ioniq provides an extra 2.4 inches which should mean more lateral space in the cabin. We’re not sure how Hyundai crafted the ergonomics of the cabin and whether or not the extra width is used to the fullest. Hyundai Motor America, a strong advocate for standardizing effective safety technologies, praises the National Highway Traffic Safety Administration (NHTSA), the Insurance Institute for Highway Safety (IIHS) and the automotive industry for working together to make Automatic Emergency Braking (AEB) a standard feature on new cars in the future. 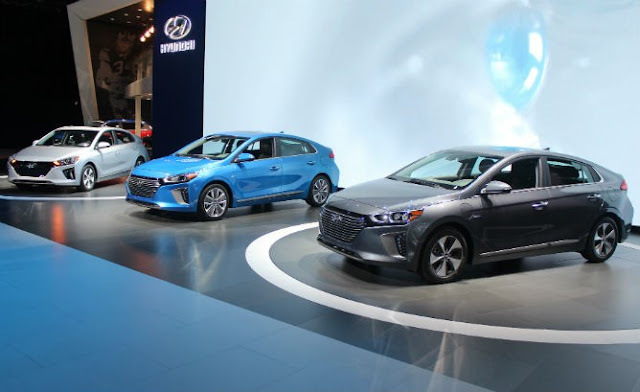 The group, in which Hyundai was pleased to participate, has developed a voluntary commitment to make AEB standard on all new cars no later than NHTSA's 2022 reporting year. 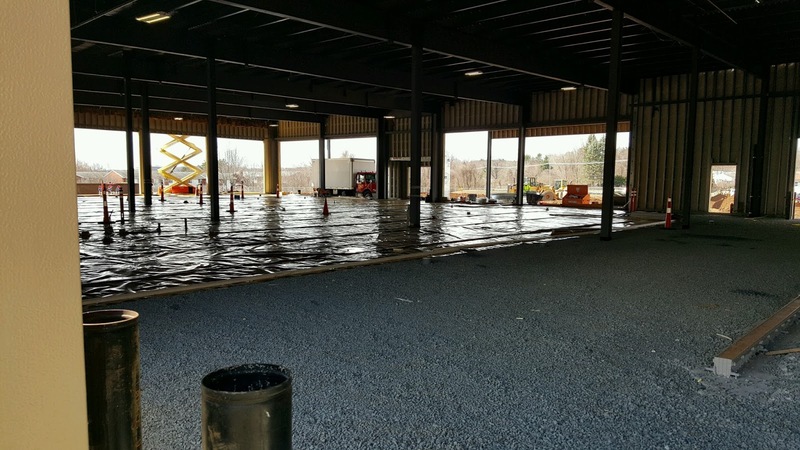 "Providing effective safety technology is essential for our customers," said Mike O'Brien, vice president, corporate and product planning, Hyundai Motor America. "With all our new models, we are ushering in new standards for safety, featuring technology proven most effective in preventing accidents in the first place, and reducing injuries should an accident occur." 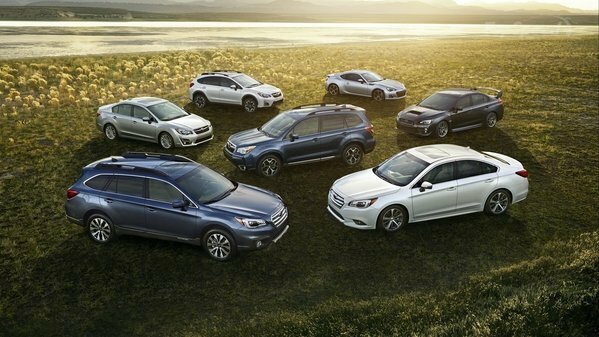 Six models are available today with AEB as optional equipment: the all-new 2017 Elantra, 2017 Santa Fe, 2017 Santa Fe Sport, 2016 Sonata, 2016 Tucson and 2016 Genesis. Coming this summer to dealerships, the Genesis G90 will feature standard AEB. Later in 2016, additional 2017 model-year Hyundai vehicles will include AEB as available equipment. AEB uses both the forward-facing radar and camera, through sensor fusion, to detect a vehicle or pedestrian, and warns the driver of a potential collision. If the driver does not react to avoid the impact, the system will apply emergency braking. The Hyundai Genesis, Tucson and Sonata models are also TOP SAFETY PICK+ rated by IIHS. Brand Keys Customer Loyalty Index. a New York-based customer loyalty and engagement consultancy, ranked Hyundai No. 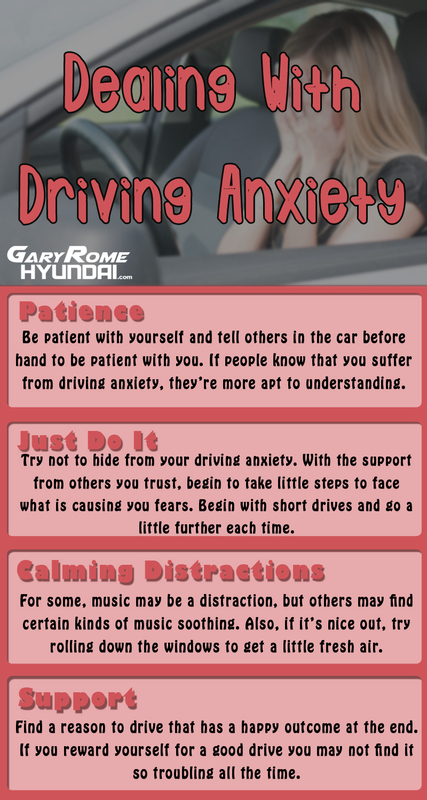 1 in the automotive category in their annual syndicated study. Brand Keys Customer Loyalty Index examines customers' relationships with 635 brands in 72 categories. Hyundai fans show their loyalty by buying another Hyundai, fans go to any length to express their loyalty, passion and dedication for their team. Hyundai is excited to connect the passion NFL fans have for football with the excitement they have for their vehicles as an official sponsor of the National Football League. "Psychologists say that seven years is a mark that a friendship will last a lifetime. It's also the seventh year in a row that Hyundai has been named #1 in our customer loyalty and engagement index," said Robert Passikoff, founder and president, Brand Keys. "When you're a brand that can build that kind of emotional engagement, and a company that can build cars that meet high expectations, you can count on customers being your friends for a long, long time. We congratulate Hyundai for the great job they've done and will undoubtedly continue to do." For the Brand Keys 2016 survey, nearly 43,000 respondents self-selected the categories in which they are consumers and the brands for which they are top 20 percent customers. Assessments fused rational and emotional aspects of the categories to identify the behavioral drivers of brand loyalty and customer engagement, which in turn gauged how well each brand met consumer expectations for each category. Not only is Hyundai involved in professional football, but the automaker also has a successful college football marketing program, through which the brand continues to connect with the millions of passionate fans across the country. But it doesn't stop there, as Hyundai is further committed to sharing the passion of loyalty as the official automotive partner of FIFA. "Hyundai has a long-standing history of being on top for loyalty," said Dean Evans, Chief Marketing Officer, Hyundai Motor America. "This means more consumers who buy a Hyundai buy another, and more than any other car at any price. Our brand mission is to make things better, from the owner to the driving experience, to keep our customers coming back." Pediatric cancer is an important health issue that affects far too many children in the U.S. At a time when they just want to be kids, these amazing youngsters are forced to deal with a very grown-up disease. 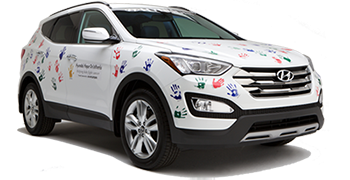 Hyundai Hope on Wheels (HHOW) is committed to raising awareness and finding a cure for pediatric cancer. Now in the 18th year, Hyundai Hope on Wheels has contributed over $100 million and could not have achieved this important milestone without everyone's support. Due to Gary Rome Hyundai's wholesale unit purchases of 497, $6,958.00 was generated for Hyundai Hope on Wheels.We are very proud that our wholesale purchases are providing hope to pediatric cancer patients, their families and our communities. To see the many faces of the kids and to learn more about the specific research projects, visit www.HyundaiHopeOnWheels.org. There you can find videos from donation ceremonies conducted across the country. 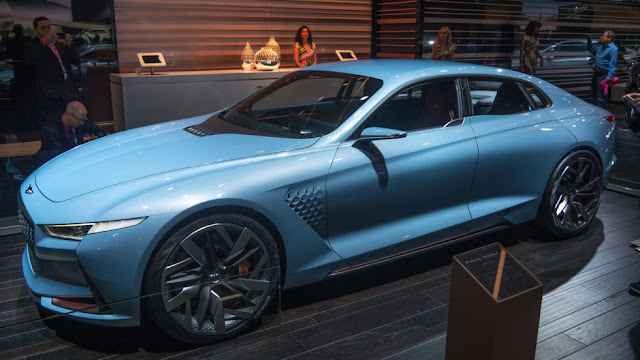 This week at the New York auto show, Hyundai plans to show a concept car that provides the clearest picture yet of the styling direction for the company’s new Genesis brand of luxury vehicles. A teaser photo of the car, released late Wednesday, shows that Hyundai has its sights set on Audi. The Genesis “New York Concept” has a pair of thin headlights adorned with LEDs that give the car a unique signature, which is not unlike what Audi does on such cars as the A7. A teaser video shows what appears to be carbon fiber and chrome accents. The car has a very large grille, and wide, bulging front fenders that blend smoothly into the hood. Hyundai will debut the car Wednesday, March 23. There have been some big rivalries in the world of cars over the years, but the Hyundai Elantra versus Mazda 3 battle is probably one that hasn’t stood out to most people. But a lot of people buy small sedans – sure, not as many as buy small hatchbacks, but when you consider the sales of just the (previous version of the) Hyundai Elantra and the sedan version of the Mazda 3 in 2015 tallied about 20,000 units, this segment clearly has some appeal with buyers. So how small are they? Nearly as big these days as Commodores and Falcons were back in the 1990s, so, not really that small. But they’re so much more cleverly packaged than the old Aussie clunkers that they make plenty of sense for potential buyers – their boots are big enough for a couple of large suitcases, and their back seats easily fit a couple, or even three, adults. So, we have the biggest-selling small sedan on the market – the Mazda 3 – and the new-generation version of the Hyundai Elantra, which is now bigger and better-equipped than ever. Talk about closely matched. These two have so many areas in which they are nearly identical it’s pretty spectacular. Let’s start with price. The Mazda 3 Touring automatic sedan we have here starts off from $26,790 plus on-road costs. The Hyundai Elantra Elite automatic costs $26,490 plus on-roads. Close. As for equipment, they’re similarly, er, similar. The pair both has leather interior trim – the Mazda with black cowhide and red stitching; the Hyundai with plain black or tan trim, if that’s your thing – and both have 7.0-inch colour media screens with Bluetooth phone and audio streaming. The Mazda has two USB inputs; the Hyundai has one.The Hyundai’s screen has Apple CarPlay connectivity, which the Mazda misses out on. Both are touchscreen units, but the Mazda also has a clever – and brilliantly intuitive – rotary dial controller that allows you to switch between menus on the move. If you prefer to chat with your car, both have voice control – the Mazda’s is an own-developed system, where Hyundai’s version relies on the Apple interface. For mapping, the Mazda has an in-built satellite navigation system, where the Hyundai only has maps through a connected iPhone – which could be a pain if you’re an Androider. But, a free update later in the year will also provide Android Auto functionality too. The pair has dual-zone climate control, automatic headlights and wipers. The Elantra has a couple of extra goodies over the 3, including LED daytime running lights, an auto-dimming rear-view mirror and a digital speed readout. While both have push-button start with smart keys, the Elantra has keyless entry buttons on the front doors – great for when you’ve got your hands full – but the Mazda misses out on that extra. The Mazda has smaller 16-inch alloy wheels, where the Hyundai has 17-inch alloys. Both cars have six airbags – dual front, front side and full-length curtain coverage – and electronic stability control as standard. Both also have rear-view cameras and rear parking sensors. But if you’re really into safety equipment, the Mazda can be had with items that the Elantra cannot be equipped with. The Mazda 3 safety pack costs $1500 and adds blind-spot monitoring, rear cross-traffic alert and Mazda’s Smart City Brake Support, which can autonomously brake the car at speeds between 4km/h and 30km/h if it predicts a collision is imminent. If value is your thing, the Hyundai takes the win in this part of the test. Let’s talk dimensions. Guess what? There’s not much in it. The Mazda 3 sedan is slightly longer than the Elantra, spanning 4580 millimetres from nose to tail where the Hyundai is 4570mm long. The 3 is taller, 1455mm compared with 1440mm, but the Hyundai is wider, 1800mm versus 1795mm. The biggest differentiator, though, is boot space. Hyundai claims the Elantra has 458L of cargo capacity, which is a full 50L more than the 3 (408L). As you can see in the images, the Mazda can still fit a regular sized pram and a large suitcase without much hassle, but the larger boot aperture of the Elantra makes loading big items in and out a lot easier, and there’s more space from top to bottom as well as from side to side. Both have levers to drop the rear seats, though you need to pull them down from the cabin – they don’t simply drop. There’s a marked difference between these two.The Mazda has a level of luxuriousness to it that makes it feel a bit special. The red stitching on the steering wheel, handbrake, gearshift surround, seats and doors really ties the cabin together nicely. The knurled metal knobs for the media system and climate controls add a quality look and feel, and while the ambience is decidedly dark, it is, quite simply, an inviting place. The Hyundai is more… more… well, there’s really no other way of putting this: it’s more boring. Yes, the layout is extremely logical. Yes, it feels more spacious as soon as you sit in the driver’s seat. And yes, it’s hard to fault the quality of the fit and finish inside. But the Hyundai doesn’t feel as premium as the Mazda – everyone in the CarAdvice office concurs. What the Hyundai does do better than the Mazda is offer a level of space and storage that pragmatic buyers will love. The 3 can make larger occupants feel hemmed in, particularly in the driver’s seat, where the Elantra gives the impression that there is a lot of space on offer, which is in part due to its larger glasshouse. The Elantra’s cabin storage includes much bigger door pockets in the front and the rear, and more loose-item storage up front. Both have cupholders between the seats and covered centre consoles. The Hyundai has its USB inputs in front of the gearshifter, which is a bit of a pain if you own one of the bigger smartphones. The Mazda’s twin USB inputs are in the centre console, which is big enough for a smartphone. The back seat battle between these two is an interesting one, too. The Hyundai has notably better leg and shoulder room, and it’s flatter seats mean fitting three across the back seat will be much easier than in the Mazda. That said, the 3 has much better headroom, and its more sculpted seats are great for two, but not for three – though you’d be hard-pressed to fit three (me-sized) adults in the back comfortably. There are rear air-vents in the Hyundai Elantra Elite (not in the base Active), but the Mazda misses out on air-vents no matter which specification model you buy. Each car has two ISOFIX child-seat anchor points, and both models have three top-tether points, too. The similarities continue under the bonnet, with both models here powered by 2.0-litre four-cylinder petrol engines. The Hyundai’s engine produces 112kW of power at 6200rpm and 192Nm of torque at 4000rpm. The Mazda’s mill has 114kW at 6000rpm and 200Nm at 4000rpm. Both are front-wheel-drive, both have six-speed automatic gearboxes – though the Mazda is also offered as a six-speed manual version in this specification, where the Elantra Elite is auto only. Oh, and the Mazda has paddle shifters, where the Hyundai doesn’t. Those paddle shifters make for a more involving drive experience in manual mode in the Mazda than you’ll find in the Elantra. If you care about taking matters into your own hands, the Mazda’s shifts are much quicker – particularly when downshifting – but both cars allow you to explore the range of engine adequately in manual mode. If you leave the car in auto mode – and, let’s face it, you probably will 99 per cent of the time – the Elantra is by far the more responsive drivetrain, with the Mazda aiming to choose high gears at every opportunity to help it save fuel. That means the Mazda can regularly react with dullness when you accelerate. It’s almost like there’s a dead spot below 2000rpm when you’re applying moderate throttle, but if you push the pedal a little further it will drop back a cog or two to gather some pace and momentum. The problem is that you have to do this a lot, and it gets tiring – particularly for passengers, especially those who may be trying to do make-up using the vanity mirrors. The Elantra’s drivetrain is entirely different. It feels peppy from a standstill, with much more urgent throttle response and liveliness as it builds revs. The gearbox is also more user-friendly, being that it doesn’t upshift to the highest gear possible at the soonest convenience. It holds gears longer, allowing you to use more the engine’s available torque. As such, changes at around 4000rpm aren’t uncommon. The six-speed automatic’s shifts are smooth, though, and it certainly makes for a lot less frustrating experience around town than the Mazda, which buzzes and hunts for gears. The claimed fuel use of these two models, though, shows what impact the Mazda’s efficiency focus has. The Elantra – which has multi-point injection and a lower engine compression ratio – claims fuel use of 7.2 litres per 100 kilometres; the Mazda has higher compression (13.0 versus 10.1 in the Elantra) and it has direct injection, and stop-start technology – which works a treat, being quick to refire when you’re ready to get moving again. As a result, it claims a miserly 5.7L/100km. On test, we saw higher than both claimed figures. The Mazda 3 used 7.8L/100km, or 37 per cent more than its claim, while the Elantra used 8.7L/100km, which is 21 per cent more than the sticker on the windscreen says. For those who do a lot of long-distance touring, the, er, Touring’s smaller fuel tank may present a problem: it has a capacity of 51L, where the Elantra’s tank is a 62L job. These two small sedans may not be the sportiest offerings in the small car segment, but neither disappoints in their driving dynamics. There’s a bit of a gap between the two in terms of their kerb weight (another contributing factor as to why the Hyundai uses a bit more fuel), with the Elantra Elite is tipping the scales at 1355 kilograms, while the 3 Touring sedan weighs 1301kg. The strange thing is that the Australian suspension tune of the Elantra means it feels lighter on its treads than the Mazda. The Hyundai feels more willing to be chucked around in corners, if that’s your thing, where the Mazda feels more tied down, with its firmer suspension tune helping it hold the road securely. That’s not to say the Elantra is insecure in its handling. It corners with plenty of grip and the front end is bitey when you change directions in the bends. The thing is, that while there is some body roll to the way the Hyundai changes direction, that makes it feel a bit more involving from the driver’s seat. The Elantra’s steering has a lot to do with that. When you’re applying lock in the twisty stuff it is quick and reacts well, though in the straight-ahead position it require more adjustment than the Mazda. The 3’s steering is perhaps more natural in its linearity, though it can be a little slower to react in corners. That said, it feels better on-centre, meaning you can comfortably cruise on the highway without having to think too much about holding a straight line. The Mazda’s steering has more feel to it, too, whether you’re tootling around town or massing miles on the motorway; the Elantra’s steering doesn’t offer the driver the same level of connectedness. Under hard driving the Mazda’s brakes felt more assured than the Elantra’s. If you’re driving more sedately – like pretty much everyone who will buy one of these cars will – the Elantra offers a more mature drive experience and a much more comfortable ride. It doesn’t pitter-patter over small bumps and inconsistencies like the Mazda 3 does, with its softer damper tune making for easier and more comfortable progress at city speeds. The Mazda’s suspension is firmer, throwing more of the lumps and bumps of the road surface into the cabin, though it can feel more settled over rippled surfaces. Both are decent when dealing with larger bumps, such as speed humps, and neither car crashed into potholes though the front-end suspension in both cars was noisy over sharp edges. The Hyundai offers a better ownership program than the Mazda, hands-down. The Elantra comes with a five-year, unlimited kilometre warranty, and has capped-price servicing for the life of the car. Maintenance is due every 12 months or 15,000km, and over a period of five years or 75,000km, the average fee is $269 per annum. Further, if you service your car at a bona fide Hyundai dealer, they’ll give you roadside assistance for up to 10 years, for $0. The Mazda has a shorter three-year, unlimited kilometre warranty, and has capped-price servicing for up to 160,000km, but requires maintenance more regularly than the Hyundai, with services due every 10,000km or 12 months (whichever occurs first). Over a five year – or 50,000km – period, the Mazda’s annual average would be a minimum of $306.20, and then if you were to do the maths over 75,000km during the same period, the cost would be at least $429.80 per annum. Further, there’s no complimentary roadside assistance plan with the Mazda. You can subscribe for a minimum cost of $68.10 per year if you so choose. So, which is the victor in this new rivalry – this battle between well-priced, well-equipped small sedans? There’s no doubt the Mazda 3 is popular for a reason. 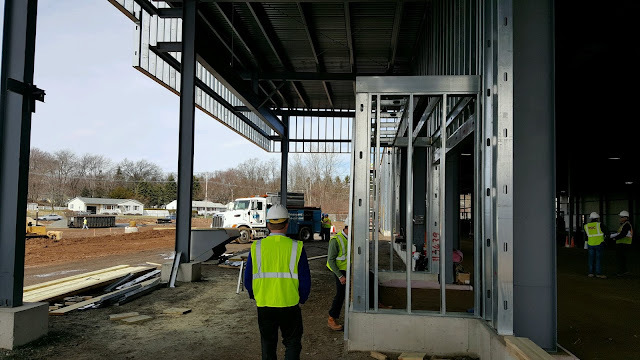 It feels special inside, and it has plenty of equipment for the money. This Touring sedan is particularly well specified, though the 2.0-litre engine could prove difficult to live with in the long run. Look, if you’ve got a Mazda 3 on your shopping list – and clearly, plenty of new car buyers do – you could certainly do a lot worse. But the thing is – it seems you could do better, too. The Hyundai Elantra is simply a more rounded – if plainer – small sedan. In Elite specification you get the majority of the goodies you could want, safety extras aside. But with its perkier engine, more forgiving road manners and better packaged small sedan body, it takes the win in this test. Hyundai Motor India is increasing production of its SUV Creta by 30% to 13,000 units a month to reduce the waiting period as bookings of the vehicle cross one lakh milestone within 8 months of its launch. “To reduce the waiting period, we are increasing Creta production by 30% to total of 13,000 units of which 10,000 units will be allocated for the domestic market,” Hyundai Motor India Ltd (HMIL) managing director & CEO YK Koo said in a statement. HMIL had launched Creta in India in July last year and since then has received five lakh inquiries for the SUV. The company has delivered 56,000 units of the model till date. Creta is available in three engine options of 1.6 litre and 1.4 litre in diesel, and 1.6 litre in petrol. “We thank our customers for the tremendous response with the record fastest one lakh bookings in 8 months. Like in the domestic market, Creta has generated great response in global markets with more than 28,000 orders,” Koo said. With Creta, HMIL has strengthened its position in the SUV segment in India and has demonstrated excellence of ‘Made in India’ products as per global standards, the company said. Besides domestic market, the SUV has received good response in global markets such as Latin America, the Middle East and Africa, the company said. 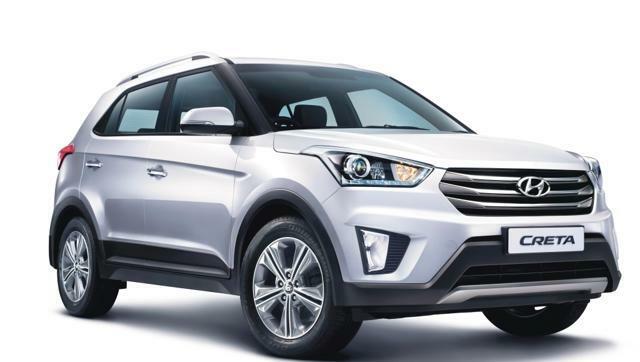 “Hyundai will continue to maintain its leadership position in the export market with the strong sales of Creta,” it added. Hyundai Capital Services issues first Korean corporate green bond for hybrids and electric vehicles (5yrs, 2.87%, $500m) Hyundai Capital Services, the subsidiary of Hyundai Motor Company (005380.KS) that provides loans and leases for new Hyundai and Kia cars, issued a $500m green bond. The inaugural green deal has a 5-year tenor and fixed semi-annual coupon of 2.87%. Lead underwriters for the deal were Bank of America Merrill Lynch, Citi, and Credit Agricole. The green issue is the first corporate Korean green bond and only the third out of Korea after KEXIM’s initial green bonds in 2013 and 2016. It’s also number 3 on the list of green bonds issued for green vehicles following Toyota’s two green ABS for hybrid and EV assets in the past couple years. Similar to Toyota (TM), Hyundai does not have a second review of its green bond. Independent reviews of a bond’s green credentials provide investors with an important insight to the bond’s adherence with best practice guidelines. Next time round, it would be great to see Hyundai adopt a market leader position and obtain a review. Proceeds from the Hyundai green bond will finance a range of Hyundai and Kia hybrids (HEV) (including the Sonata HEV, Grandeur HEV, Ioniq HEV, K5 HEV, K7 HEV, Sonata PHEV) and electric vehicles (EVs) (including the Soul EV, Ray EV and Tucson ix Fuel Cell). So, how do we determine what vehicles are green? Late last year we finalised the Climate Bonds Standard for Low Carbon Transport, which includes eligibility criteria for low emission passenger vehicles. Our Technical Working Group (TWG) and public consultation process both concluded that private vehicles should meet emissions threshold (based on data from the IEA mobility model and Global fuel economy initiative). For cars to be considered green under the Climate Bonds Standard, they must meet, or be below, a maximum emissions level of 85-90 grams of CO2 per passenger kilometre travelled (g CO2 p/km). The Hyundai and Kia Hybrids in this green bond are all under a 110 g CO2/pkm maximum emissions – so not far off the standard threshold. This is compared to the top performing petrol and diesel cars, which struggle to get below 110 g CO2/pkm in emissions. These thresholds apply to hybrid vehicles that use both fossil fuels and electric technology for motive power but it’s much easier to classify all electric or fuel cell vehicles. These types of vehicles ​are considered ​green under the Climate Bonds Standard​. We sometimes hear arguments along the lines of ‘but what if the electric vehicles are using electricity from a brown grid – is that still green?’ – well, yes! Here’s why: we can’t hang around for 20-30 years until we’ve transitioned all electricity grids to green energy sources before developing and adopting low emission vehicles technologies. We need to use the time now to get our technology up to scratch so that we develop highly efficient vehicles by 2050. So, all electric vehicles are in; full stop. Back to this deal - it’s fantastic to see another green bond from a car manufacturer. It is financing technology crucial for a transition to a 2-degree future. Welcome to green bonds Hyundai!